Sonic fans, the wait is finally over. After more than a decade of mediocre console games, Sonic the Hedgehog is back in a brand new and 2-D adventure reminiscent of the classic Genesis titles we know and love. Sonic the Hedgehog 4: Episode 1 is a wonderful platformer that pays homage to the blue blur's glory days, back when it was all about speeding through loops, launching the popular mascot off jump pads and grabbing as many gold rings as possible. It's a bit short, but with so many secret areas and new locations to explore, you'll enjoy this one for weeks to come. Sonic 4 succeeds for a plethora of reasons, starting with simplicity. Instead of overcomplicating the controls or shoehorning some insignificant gimmick into the game, Sega returned the hero to his 2-D roots, where the primary challenge is to reach the goal in the fastest time possible while avoiding Dr. Eggman's robots and other hazards along the way. Not only was this a smart decision, but the developers absolutely nailed it. This game feels like 16-bit Sonic. Naturally, there are few differences. For starters, you'll need to use the homing attack from Sonic Adventure to get around. While not a staple in previous 2-D Sonic games, it works wonders in this new effort, as you can jump from robot to robot to avoid spikes, or zero in on a vine. 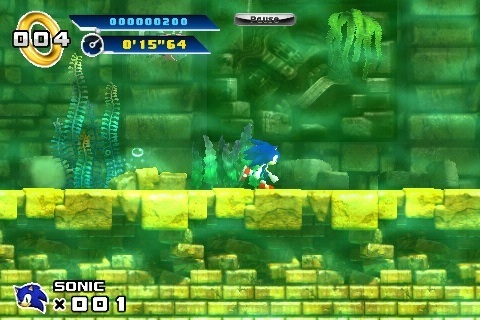 Then we have the levels, which are a delightful mix of retro Sonic goodness with modern day flavor. The tropical themed Splash Hill Zone, for example, rekindles fond memories of Green Hill Zone from the original Sonic, except you'll get to use zip lines and wander through a sunset themed stage. Then we have Lost Labyrinth, a zone that takes place in ancient ruins. 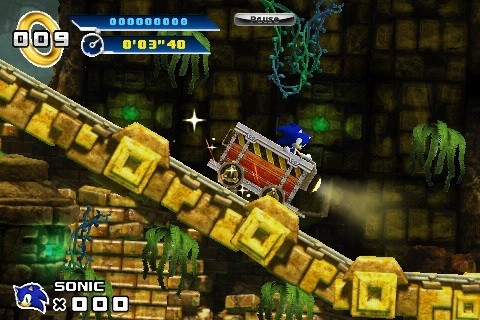 Here, Sonic must hop into a mine cart, light the way with a torch and balance atop a huge metal ball. Later, you'll do a little gambling in the pinball/playing card hybrid, Casino Street, and wander through a more industrial section called the Mad Gear Zone; no relation to the gang from Final Fight. For the most part, these levels are fairly easy to get through if all you want to do is reach the exit. Finding all of the hidden rings and covering every nook and cranny, however, will take considerably longer to achieve. Sure, you could blow through the game in one sitting, but you'd miss out on tons of cool stuff, including a bonus stage inspired by the ones from the previous Sonic titles. Visually, the game stands apart from its predecessors with sharp and colorful graphics that look phenomenal in high definition. Sega did excellent work bringing each stage to life, making them unique without tarnishing Sonic's legacy. It's a pure joy to watch. On that note, the same goes for the audio. First, Sonic doesn't talk, which is definitely a good thing, and second, the music perfectly fits the game. Each zone has a collection of happy beats that, like other elements, will remind you of the hours spent with the Genesis many moons ago. That said, it's nowhere near as good as the stuff in the first three Sonic games from back in the day. Not even close. On the downside, the game does go by in a hurry, there's little complexity to the showdowns with Eggman and some trial and error will force you to give up lives at a rapid clip. We also wish that Sega included some bonus content. Otherwise, Sonic the Hedgehog 4: Episode 1 is the Sonic title we've craved for years and then some. Do yourself a favor and buy it ASAP on WiiWare (Monday), PSN (Tuesday) or Xbox Live (Wednesday). As a Sonic fan, you've earned it. What's Hot: Classic Sonic gameplay, beautiful graphics, solid controls, excellent music, plenty of variety and secret areas to find. What's Not: A bit on the easy side, only a handful of modes, no co-op.